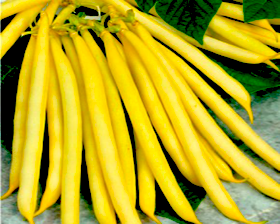 A very attractive yellow bean with longish pods and resistant to all the common ailments of dwarf beans. Remains yellow when cooked. Well worth a go! Sow April indoors or late April to July outdoors. Sow seed 4cm deep in pots or trays of good seed compost. Place in a propagator or seal container inside a polythene bag and place at 18-21C until germination which takes 7-10 days. Can also be sown direct outdoors once the soil has warmed sufficiently, sow 15cm apart, 4cm deep.